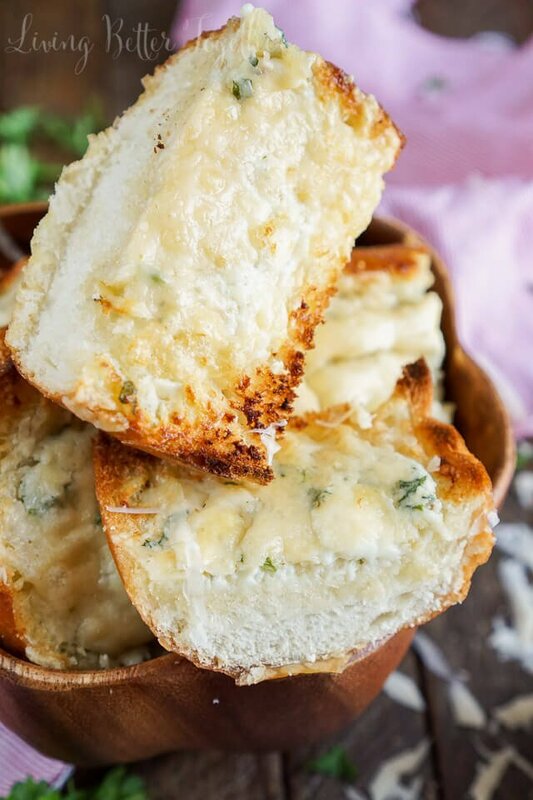 This 15-Minute Blue Cheese Garlic Bread is studded with flavor thanks to a vibrant blend of cheese, butter, and fresh herbs! So Matt will tell you I’m weird. I’m weird for a lot of reasons (aren’t we all? ), but he REALLY finds it strange that I have to have bread with my dinner. I’m not sure why exactly he finds that to be such a novelty, especially since he come from an Italian family… isn’t it kind of rare to have an Italian meal without bread? But it’s fine, call me the weird one, my Nordic French-Canadian stomach is happy to eat ALL of the bread alone! 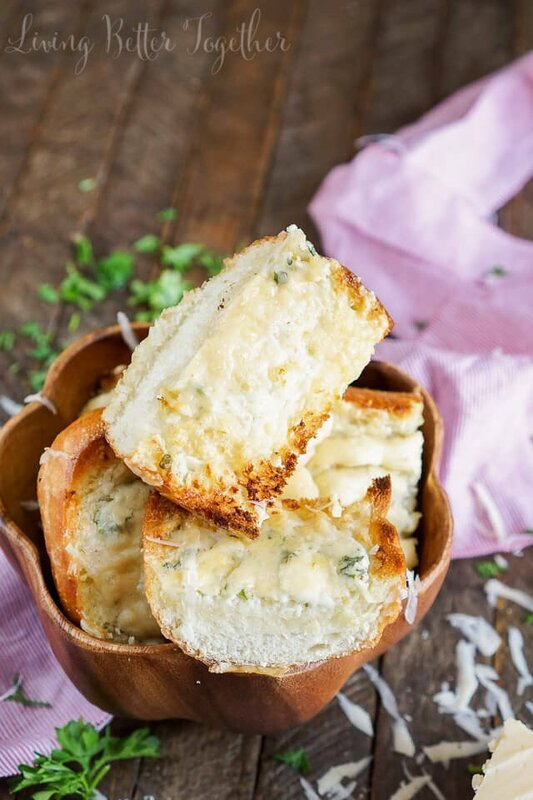 Now when it comes to bread, I’m a serious sucker for garlic bread… like give me a loaf of it and I don’t need the salad or pasta, just the bread, thanks! But of course, I leave it alone and I have to add cheese… everything should have cheese in it, right? Except cocktails… that could get a little weird… even too weird for me. 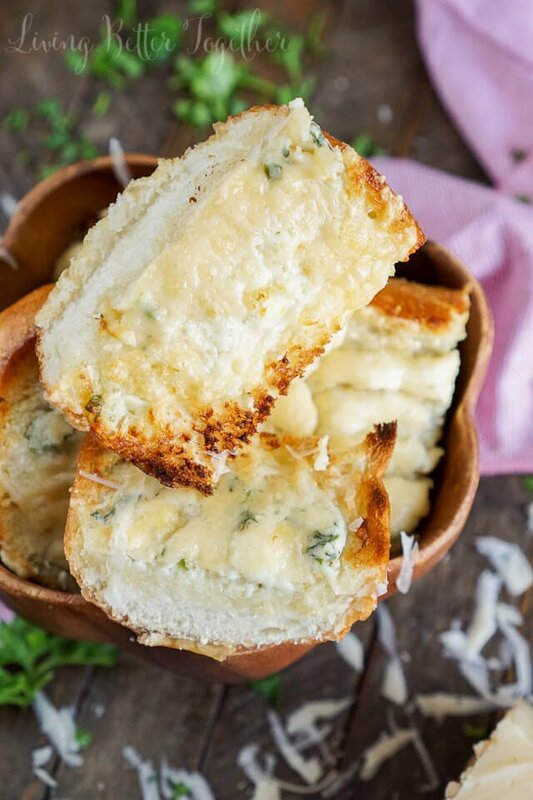 Anyways… garlic bread + cheese = carb heaven! 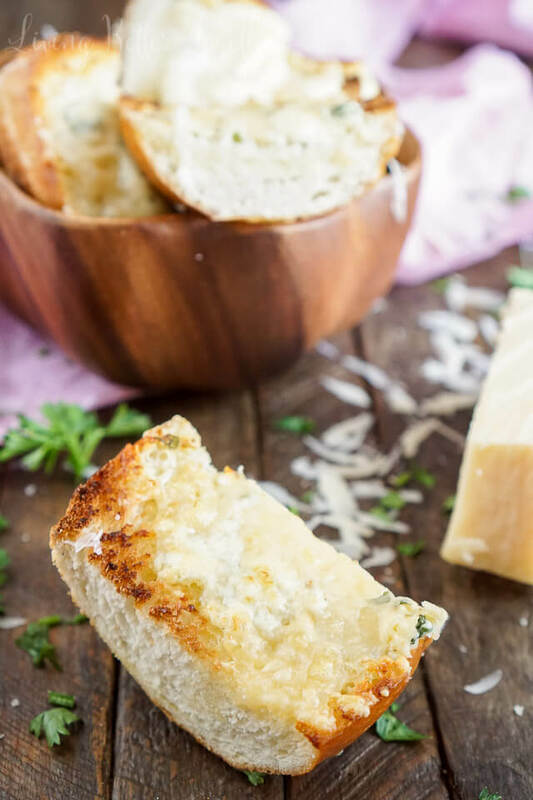 I love using a mix of cheese to really bring the bread to life and one of my favorite combos is Blue Cheese and Parmesan. Now wait a minute, hear me out, I know what most of you are thinking… Blue Cheese???????? (in that why oh why whiny voice we all have, don’t lie, you know you have it too). 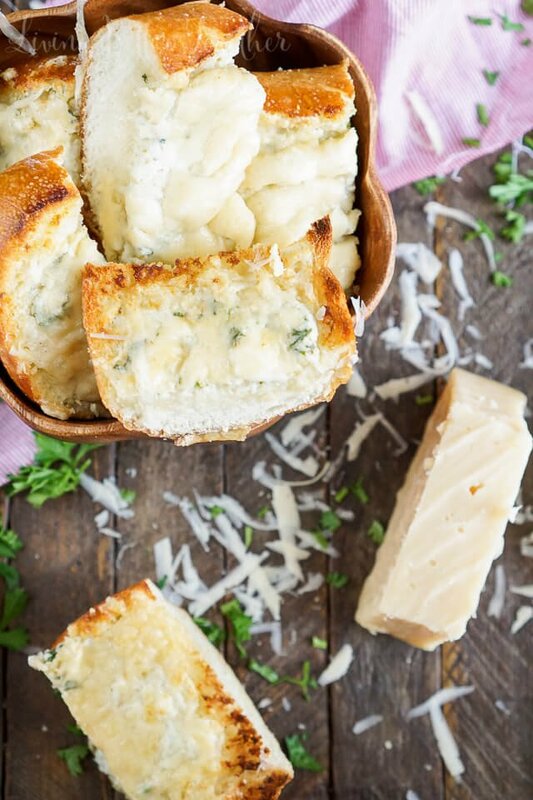 Guys, this isn’t cold dressing on a salad, this is Stella® Blue Cheese melted down with Parmesan, butter, and herbs into a soft loaf of Italian bread and it is pure freakin’ perfection! Forget the Mozzarella – these sharp flavors are where it’s at! So just give it a chance, even my blue-cheese-and-bread-with-dinner-hating husband loved it! Like we may or may not have had just this bread for dinner last Sunday. We had mini apple pies for lunch and baked ziti for breakfast too, so somewhere in there it all balances out, right? 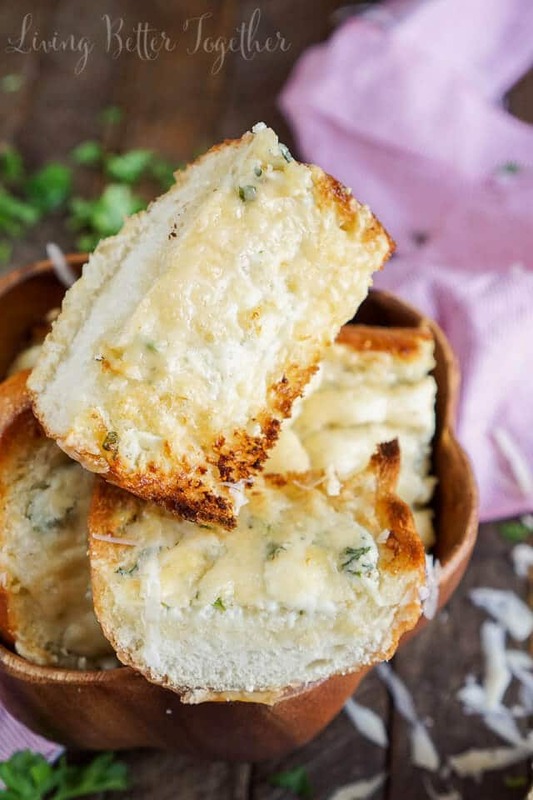 But seriously, this bread will change the way you feel about blue cheese! Stella® Italian-Style Cheeses are the perfect way to bring a dish to life. 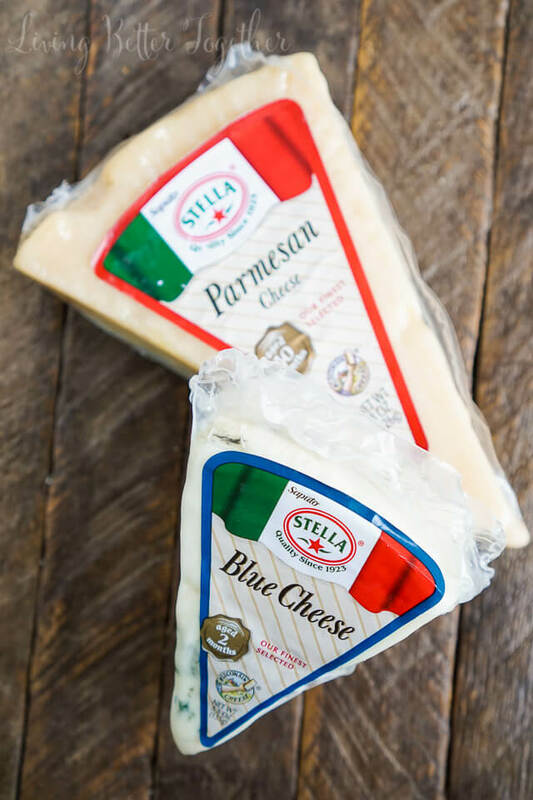 Stella® cheeses are flavorful and combine old world craftsmanship with rich dairy heritage, dating back to 1923. Plus, Stella® wants to give one of you a three day, two night trip to New York City with a $500 gift card, dinner for two, and two tickets to a Broadway show! Who wouldn’t want to win that! You can enter the giveaway here. 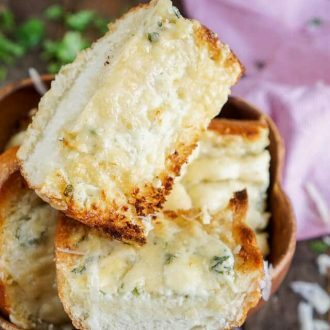 So make this garlic bread as part of a fun at home date night and dream about that dinner and a show in beautiful NYC! In a medium bowl, whip together butter, blue cheese, garlic, parsley, salt, and pepper until evenly mixed and creamy. Slice the Italian bread in half so it's got a top and bottom and place on a baking sheet. Evenly spread the butter mixture out on the cut sides of the bread and sprinkle with Parmesan cheese. Broil on low until cheese is melted, bubbly, and starting to brown in areas, about 7-10 minutes. Follow Stella® Italian-Style Cheeses on Facebook, Pinterest, and Instagram for more recipe inspiration! Congratulations! This post is featured over at Diana Rambles today and has been pinned in the Featured at Diana Rambles board at Pinterest, Tweeted, and Stumbled. Please grab a featured button off my button page or via the post guidelines graphic. Thanks for sharing this awesome idea! These sound so good! Thanks for posting. Hello from What’s Cookin Wednesday. this looks amazing and I’m making it right now. I just got to the end where it says ‘broil on low ‘? I’m not sure but I’m going to assume this means in a lower rack. Hopefully it turns out a good as yours! Hi Gina, most ovens have a low broil and a high broil setting, usually indicating the strength of the heat. I hope you enjoyed the garlic bread.